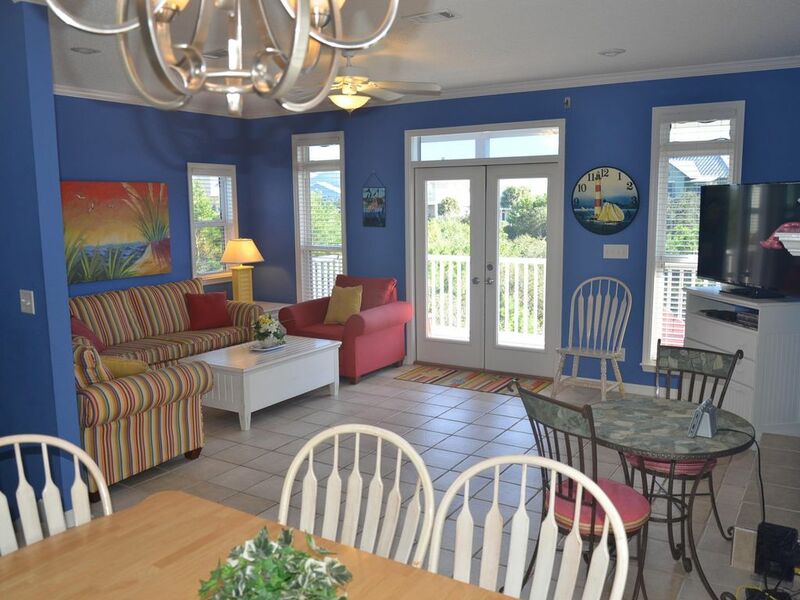 The Flamingo Cottage, located in Santa Rosa Beach, is the ideal spot for your next vacation! The cottage is located along scenic highway 30-A in South Walton County. Just 5 minutes from Seaside and 12 minutes from Sandestin, the cottage is convenient to anything you wish to experience. The Flamingo Cottage offers Free Unlimited Long Distance calling, Free High Speed Internet access with WIFI, and Premium Cable Movie Television channels for viewing. Free HD Digital Netflix movies are available on all flat screen televisions. The Flamingo Cottage is part of the very exclusive, gated community of Old Florida Beach. This community offers three private beach walkovers and a private pier on Draper Lake. Flamingo Cottage offers four covered decks/balconies. Since there is no highway or busy street to cross, all of the guests walk to the beautiful Gulf of Mexico. The sand dunes begin just 50 yards from your back door. This gorgeous, private beach offers sugar white sands, beautiful blue water, and all of the relaxation you can handle. If you somehow become tired of the beautiful beaches, the cottage is positioned just ten steps from the new heated community pool and large lanai. With only 40 homes in the community the area maintains a degree of warmth and privacy that will only enhance your vacation experience. After a day at the beach, The Shops at Gulf Place are just a short stroll away. Gulf Place offers chic boutiques, a summer concert series, and exquisite cuisine offered in a variety of restaurants. The Sandestin Outlet Mall, one of the largest upper scale malls in the region, is located just 12 minutes from the cottage. Flamingo Cottage has approximately 2800 square feet of living space. There are also four covered balconies with a screened master balcony that adds an additional 500 square feet for your entertainment pleasure. The first floor has 3 bedrooms. The largest is the master suite with a king size bed, sofa, large private bath with jacuzzi tub, two person shower, and private screened balcony. The second bedroom has a queen size bed and a private balcony. The third bedroom has a twin over full bunk bed with a pull-out trundle. This bedroom also has a balcony. There is a second full bath on this floor. All bedrooms are fully furnished to include a flat screen TV, bluray DVD, and telephone. The second floor has a large den with queen sleeper sofa and kitchen as well as a second master with king bed that connects directly to the second floor bath. The kitchen has all new stainless steel appliances. There is also a large laundry room/pantry with lots of shelves and a washer and dryer. For your convenience, the kitchen is fully-equipped with all major and minor appliances (especially a working blender!). The den has a large flat screen television, stereo, bluray DVD, two sofas and a beautiful view of the pool. The third floor tower has a pub table, flat screen TV, bluray DVD, and a queen sleeper sofa. Perhaps the most enjoyable thing about the tower is the beautiful view of the Gulf of Mexico and Draper Lake. The tower is an ideal spot for happy hour, quiet reading, or a nice place to send the kids to enjoy a movie, allowing the adults to have some quiet time! The Flamingo cottage is no ordinary cottage. While vacationing you will enjoy many architectural amenities such stone tile, nine foot ceilings, crown molding throughout, corian counter-tops, recessed lighting and oak stair cases. The two car garage is 25x25 which will accommodate two of the largest SUVS or trucks. There is an outdoor shower available for your pleasure after your visit to the pool and beach. A vacation along the Emerald Coast will be a vacation filled with wonderful memories of beautiful white sand beaches and gorgeous sunsets for years to come. Please consider renting the Flamingo Cottage, located on Santa Rosa Beach when making your next vacation plans. For the moment, it is one of the best kept secrets along the Beaches of South Walton. The homes are large with the largest lots anywhere on 30-A. Our community is gated and quiet. We plan to retire in this home. Within walking distance to restaurants, bars, shopping, ice cream/coffee parlor, wine festival, local band and entertainment. San Destin Outlets are only 10 - 15 minute drive from the property. toilet, tub, shower, Shared by bedrooms 2 and 3. 50 Yard walk from the back of our property to the top of the Sand dunes. The home has views of Draper Lake from the third floor tower. The home has some views from the second floor but more views from the third floor tower. Please refer to the picture gallery for your exact views. The home has views of Draper Lake and of the Ocean from the third floor tower. Is not connected to gas. Full size for two of the largest vehicles. Hi-speed wifi or direct connect. Fully furnished with just about everything you could want in a vacation kitchen. All stainless appliances. Dining Table seats 8. Bar seats 5. Additional round table seats 2. Located in every bedroom and in the den and tower. Approximately 150 channels via MediaCom. Netflix is loaded on all TV's. Lots of card games and puzzles are offered in the den. Knee boards and floats are offered in the garage. Use your smart phone with WIFI for Pandora music. Netflix app is loaded on all of the flat screen televisions. You can also log onto Netflix with your account or create a new account and custom your HD Digital movie selections. Offered on the first and second floors on both the North and South sides of the home. Outdoor decks provided on first and second floor on front and rear of house. Santa Rosa Beach Golf and Country Club located 1 mile from home. Free unlimited Long Distance Telephone calling, Free High Speed Internet Access with WIFI, Free Premium Cable Movie Television Channels, Free Netflix Digital Movies, Two Car 25 ft, x 25 ft, Garage For The Largest SUVS, Parking For Six Cars Total On Concrete Driveway, Custom Cabinets, Corian Countertops, Stone Tile Flooring, Large Master Suite With Whirlpool Tub, Two Person Shower, MSTR, Has Private Screened Balcony, Four Covered Balconies, Outside Shower, Ten Steps To Brand New Heated Pool, Blender, Primary rental person must be 25 years of age or older.